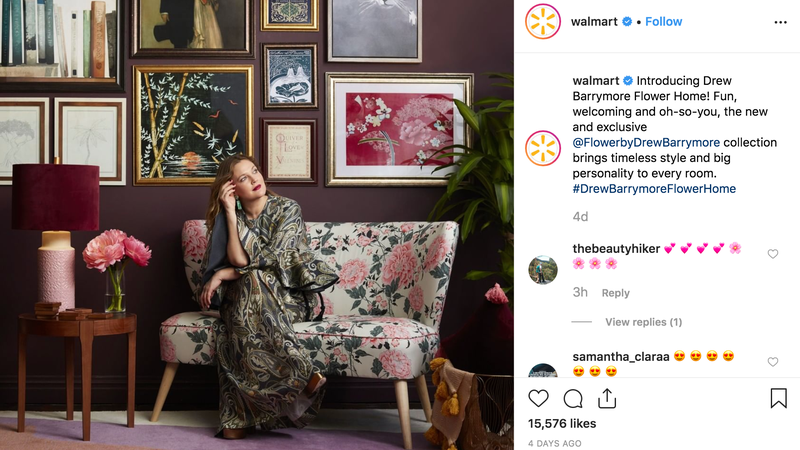 Drew Barrymore has launched a furniture and home goods line called Flower Home at Walmart with the goal of sharing her “bohemian” style with the general public at affordable prices. It’s a noble aim, but just how true to her personal taste are all 200+ items? Allow me, a human with zero traditional interior design training and a whole lot of opinions, to be the judge of that. Sea shells, the flowers of the sea! These are gaudy in a particularly Florida Airbnb kind of way (you know, the furniture that adorn every villa in Kissimmee, FL and the other small cities adjacent to Disney World?) That said, they’re kinda cute. $26 is pretty affordable, too, especially considering they weigh four pounds. I love these friendly looking birds (and once again, the color scheme suggest a strong Florida vacation vibe) but why is it $124? It’s a print in a nice frame, and it’s quite large, but for more than one hundred dollars? That’s, like, 31 rolls of white Christmas lights at Walmart, or 25 bags of Tyson-brand chicken nuggets. Not a deal. If you don’t have children, or pets, or a messy partner—these creamy white fabric baskets make for a great accent. But I believe in the power of Ikea, where you could probably grab something of equal or greater value for less than that $70 price point. If you’re in the market for a $200 dog bed then perhaps you don’t need to shop at Walmart, however, this is absolutely gorgeous and I’m considering taking the plunge despite not having disposable income, or a dog. Barrymore, buddy, if you’re reading this—this is where your design skills shine. Upholstered beds are expensive, but this one looks like you’ll get some bang for your buck. It’s gorgeous. I’ve noticed a trend: when the Flower Home collection isn’t distracted by beach vacay iconography, it appears to go full mid-century modern with warm mustard tones, wood and velvet. That’s certainly a furniture trend right now but for good reason: this is a timeless chair. I’m speechless. The human boy, the dog head... it’s.... it’s... perfect. “I have always had a love for creating joyful spaces—places where unexpected prints and patterns, shapes and styles, and colors and textures come together in the most delightful way,” Barrymore told Elle in preparation for the launch of Flower Home. “My new collection of furniture and home decor is inspired by this passion and I hope it inspires everyone to make themselves at home.” For the most part, that’s true—except when she’s going for straight for vacation looks. Regardless, it’s a nice, diverse, extensive collection of eclectic items that won’t leave a Goop-sized hole in your pocket.